Home Cricket Games 2017 EA Sports Cricket07 How To Install Patches In EA Sports Cricket 2007? 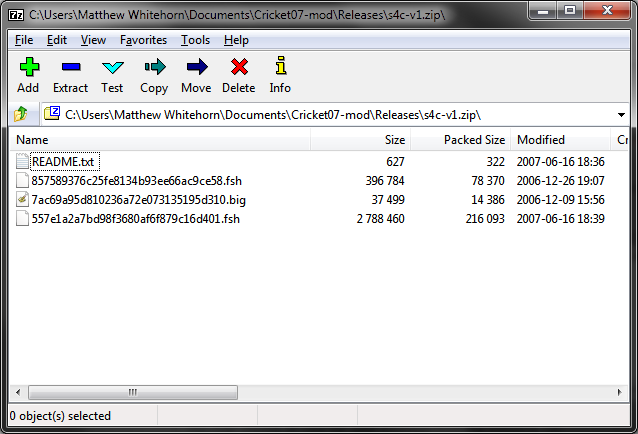 Hello All, Have you ever wondered how to install cricket 2007 patches? Here’s an installation guide by a PlanetCricket’s member “Burma’s Finest“. The number of posts appearing asking how to install this and that is rapidly increasing. In order to avoid threads becoming bogged down with such questions, I have decided that this sticky thread should answer all such questions. Consequently, posts elswhere asking how to install things will be deleted unless there is good reason not to. 1) Patch-makers normally post their downloads in .zip files. It is recommended that you download and install the latest version of 7-Zip if you have not already done so. or WinRAR/WinZIP or any archiver. 7-Zip is compatible with most compression systems, including ZIP, RAR and 7z, the formats most commonly found in mods. From there navigate to where you saved the file you downloaded, and double click to open it. You will then see the contents of the download. These are typically .fsh and .big files – though you may find other types from time to time. To open inside those to get the actual files – most should include a readme.txt file to explain the details of this. 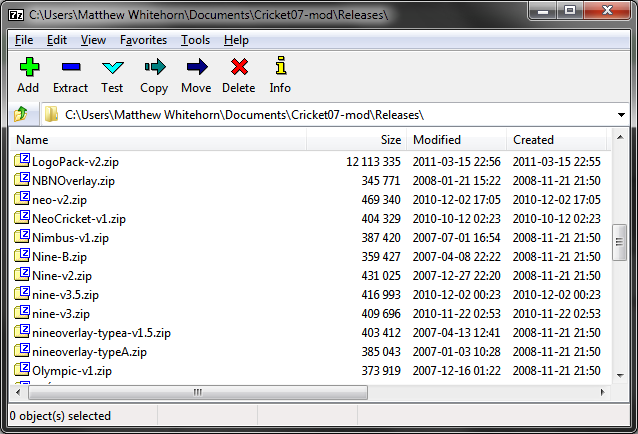 You can either browse to the directory where you have installed Cricket 2007 – by clicking the […] button to open the file tree window shown; or you can enter it manually in the box on the first screen. 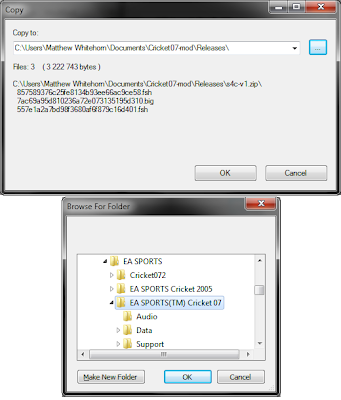 By default, the game is installed to C:Program FilesEA SPORTSEA SPORTS(TM) Cricket 07 – this is known as the root directory. However, for rosters, you will instead need to navigate to the ‘EA SPORTS(TM) Cricket 07′ in your My Documents folder. Putting %userprofile%My DocumentsEA SPORTS(TM) Cricket 07 into the address bar should take you there. Rosters go in a folder named the same as the .ros file you are using, and typically will come like this in the download, such as in the image below. 4) Once you have the path correct press the Ok button to perform the extract operation. For rosters once extracted, you will also need to select the roster in game, by going to My Cricket > Load/Save > Load > Roster and selecting the roster that was named in the download. After this, go back to Save and save your profile to make it the default when you load the game. For Face and Bat patches, you will need to assign them in the roster, or download a roster with them already assigned. For most other patches they should work without further input unless the patch has any other specific instructions. Patch-makers are encouraged to include a text file with instructions of how to install their patch. This is known as a readme file and you should always read the instructions included within it before posting queries in the comments. Previous article EA Sports Cricket 2007 JukeBox Maker – Add your own music!